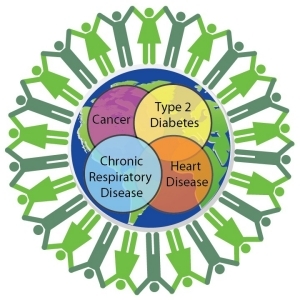 Non-communicable diseases (NCDs) such as type 2 diabetes, heart disease, stroke, cancer, asthma and dementia are so common worldwide that they are now considered to be an epidemic. NCDs are the leading cause of global death and are associated with substantial society and healthcare costs. We urgently need new ways to reduce the occurrence of NCDs in our community. Research from the field of Developmental Origins of Health and Disease (DOHaD) shows that NCD risk is influenced by nutritional and non-nutritional exposures in early life (even before we are born), as well as factors such as family history, nutrition and lifestyle in adulthood. The opportunity for communities to consider this knowledge, and develop programmes and strategies to support improved nutrition and well-being for future parents, pregnant women, infants, children and teenagers is valuable. It offers opportunities for preventing risk factors that contribute towards NCDs. But before programmes are designed to support communities to understand this evidence and act on it, we need to find out what the public understands about NCDs, NCD risk factors and DOHaD concepts. This information will help us to develop programmes based on what is needed, and are therefore more likely to succeed. This research is exploring DOHaD awareness and understanding in a range of groups including the general public, teenagers, health professionals, and teachers. Dr Jacquie Bay, Director LENScience, Liggins Institute, University of Auckland, New Zealand (Principal Investigator, New Zealand). Professor Masahito Oyamada, Department of Food Science and Human Nutrition, Fuji Women’s University, Sapporo, Hokkaido, Japan (Principal Investigator, Japan). Bay J, Dixon, R., Morgan. S., Wall, C., Oyamada, M. Characterising Public Understanding of DOHaD to Inform Communication Strategies. 9th World Congree Developmental Origins of Health and Disease Nov, 2015; Capetown, South Africa: Journal of Developmental Origins of Health and Disease 2015. Oyamada M, Dixon R., Wall C., Lim A., Bay J. Characterising the potential of undergraduate courses to facilitate understanding of DOHaD concepts in populations of future health professionals. Journal of Developmental Origins of Health and Disease. 2015;6(Supplement S2):S75.